When Haruo Takano, a Tokyo sixth-grader, comes home in the middle of the afternoon after a full day at school, he has a quick snack and takes a nap for an hour or so. Then promptly at 5, he packs up his books again and heads off to a second school, where he studies until 9. Back home once more, he locks himself in his room for two hours of homework, including one with a private tutor. Not until midnight is little Haruo, 11, finally allowed to turn out his light. Says he, wearily, "I'm happy only when I hop into bed." Haruo's grueling day is not uncommon in Japan, where a child's chances for future success in politics, business or the professions depend heavily on the prestige of his gakureki -- literally, his academic background. One index of the increasing pressure on young Japanese to pile up an impressive gakureki is the phenomenal rise of after-hours or week-end schools known as juku. Their main purpose: to help students cram for tough competitive entrance exams required to get into the most select high schools and the best colleges. Kindergarten Juku. A generation ago, there were only a few juku; today some 600,000 large and small ones are in operation, or nearly 17 for each of Japan's 35,400 primary and secondary schools. Fully 6 million of Japan's 10 million primary school students attend juku in the hope of bettering their chances of getting into the top junior and senior high schools, some of which accept only one in 20 applicants. Millions more go to other juku to prepare for college. The recent coming of affluence has also brought juku that prep children for kindergarten -- and even some that ease the way into other juku. The schools range from one-room, family-run operations with perhaps 20 students in rural areas to vast urban mills like Tokyo's Yotsuya Otsuka, which has an enrollment of 15,000. Fees run as high as $100 a month, for which the juku, using the same rote memory teaching system that is the staple of Japan's public schools, give students hours of drilling in the sort of names, facts and dates that come up in multiple-choice school entrance exams. Quality varies widely. One of the best-regarded juku, Tokyo's Nipping Shingaku Kyoshitsu (Japanese Entrance Examination School), is so popular that children commute to its Sunday sessions from distant areas by jet plane and bullet train. Some 2,600 pupils all sixth-graders prepping for the junior high entrance exam -- attend the school. A typical class starts at 8:30 a.m. and continues for 50 mutes with the teacher asking questions and 100 pupils chanting back the answers. ("When did the Russo-Japanese war break out?" "When was the League of Nations formed?") Recently, a visitor asked one student if she found the routine boring. "No," she replied determinedly. "It's very useful." Not everyone agrees. Toyokichi Endo, a Tokyo elementary schoolteacher who is a leading critic of the juku, calls them "unhealthy and unnatural" institutions that turn children into "monsters capable of coping with entrance tests but little else." Others worry about the gakureki system that has spawned the juku. 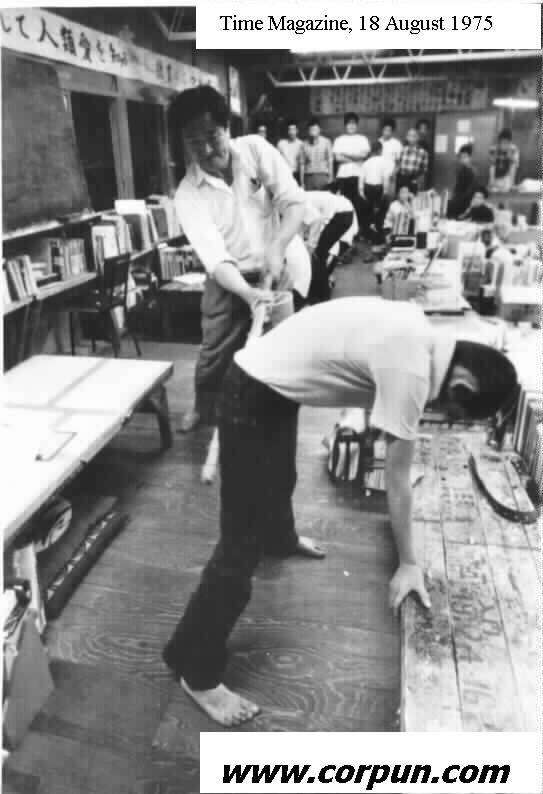 The merciless competition for places in top schools has been deplored by, among others, Sony Corp. President Akio Morita, author of a 1966 book on "the importance of disregarding gakureki."